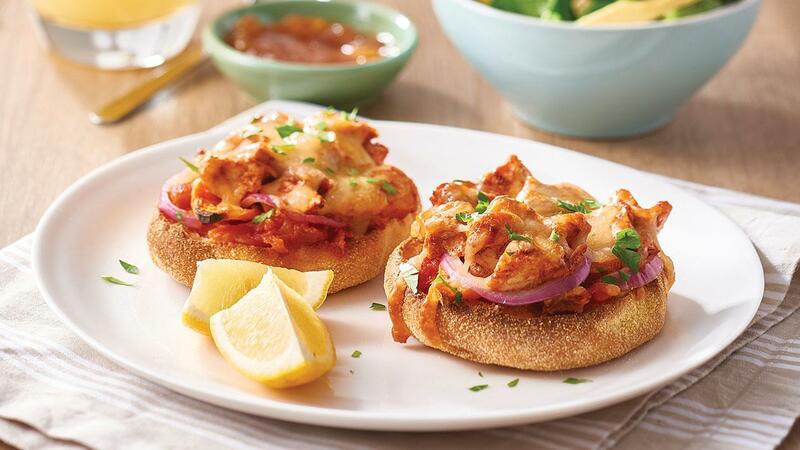 Using KNORR Patak's Tandoori Paste to marinate the chicken gives this pizza a great depth of flavour. Combine KNORR Patak's Tandoori Paste, yoghurt and water. Add chopped chicken, cover and refrigerate for 1 hour. Spray sweet potato slices with cooking oil spray and bake at 200 degree Celsius until tender. Toast English muffins. Spread with KNORR Pronto Napoli. Top with some sweet potato, Spanish onion and chicken. Sprinkle with cheese. Toast for 5 minutes until golden and fully heated through, then remove from the oven and sprinkle with coriander if desired. Serve with steamed vegetables or salad. The pizzas may be baked rather than toasted once toppings are added. Bake at 200 degree Celsius for 10 minutes or until golden and fully heated through.